A unique and fun style, these twisted love knot earrings in 14K yellow gold from Apples of Gold Jewelry offer a fun new design that you will love! The love knots are made of high quality 14K yellow gold for a warm and inviting look, and have a textured, almost rope like design throughout the entire looping love knot. The rope design adds a bit of elegance to the earring, which measures 12mm by 12mm each in size. The earrings are held in place with a post and push back closure. 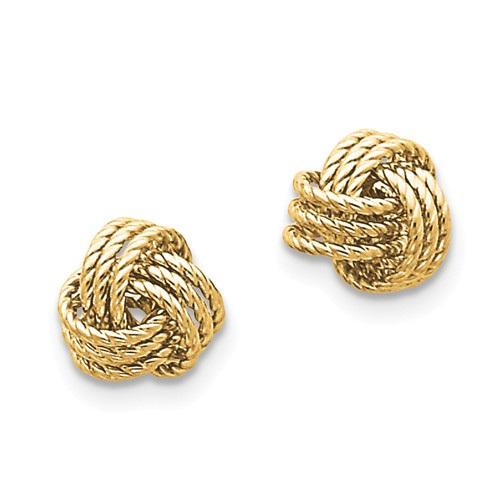 We guarantee our Twisted Love Knot Earrings, 14K Yellow Gold to be high quality, authentic jewelry, as described above.